Mini Circuit Breaker, 10ka, C curve, 2 pole, 20A, Semko, CE. 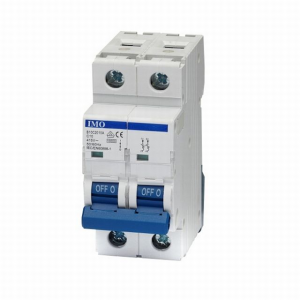 The IMO Mini Circuit Breaker design incorporates a protective indicator and utilises a secured plastic window to facilitate identification labelling. It also offers a test point facility, and improved mechanism for extended life with an enhanced Din Rail fitting mechanism. A full range of accessories is also available: Busbars, Auxiliary contacts, Locking device, etc.